Your gut health is related to your overall wellbeing with approximately 80% of your immune system being located there. Therefore keeping your gut microbiota balanced is one of the keys to maintaining not only a healthy digestive system but general wellbeing. Each species of bacteria plays its own role in contributing to overall health. The individual intestinal bacteria have their own specific role and need different nutrients to develop. You not only need sufficient numbers of friendly gut bacteria, but also a great diversity of bacteria types to be healthy. 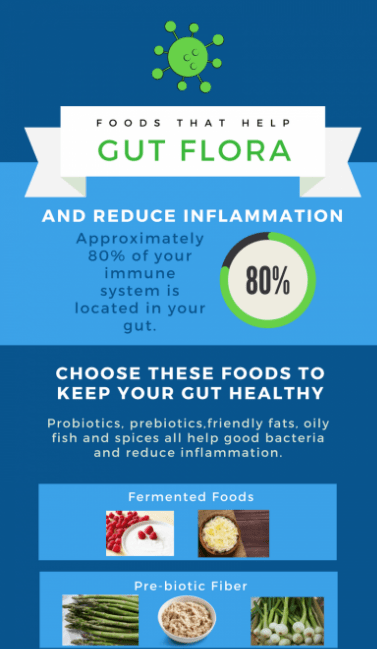 Good gut health impacts how your body uses nutrients from your diet, so the development of a diverse microbiota from foods that help gut flora is important. Increasingly, good gut health is being understood as helping with many modern day health conditions such as Type 2 diabetes, obesity, arthritis, chronic fatigue syndrome, and inflammatory bowel disease. A standard western diet full of refined and processed foods is not conducive to good gut health. This infographic by Quit Chronic Fatigue explains the types of foods to include in your diet to help gut flora and overall wellbeing.